Necklace of Rainbow Fluorite Beads and a Silver Fish - SOLD! Every year in May / June takes place the Handel Festival in Halle (Saale) / Germany, the birthplace of George Frideric Handel. Our Handel Festival is the largest music festival in Saxony-Anhalt - Halle (Saale) is the center of European Handel preservation. To help you getting your favorite item, I have the collection divided into Music Pieces, Baroque Pearls and Pompously Porcelain. 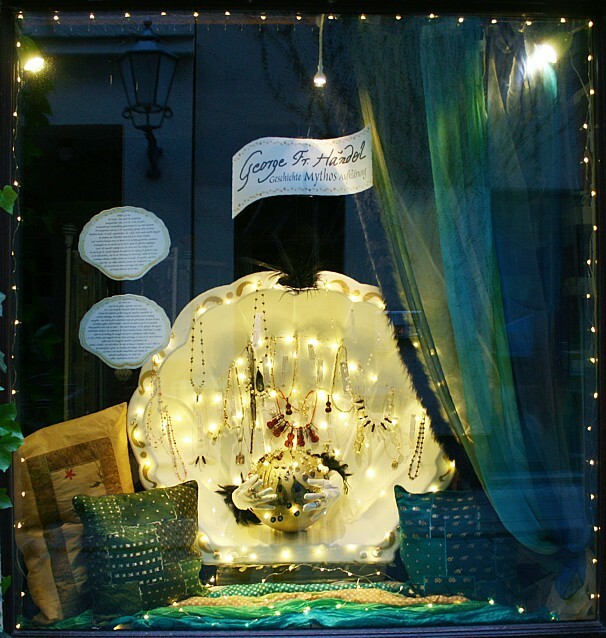 During the Handel Festival 2015 I exhibited the "music pieces" in a magnificent golden frame, illuminated by tiny lights in the window of the Klunkerfisch-shop in the little street "Kuhgasse" in Halle - and promptly won the first prize in the shop window competition on the theme "Handel and his interpreters". For the showcase competition in 2016 I created a baroque seashell grotto / a prompter shell for the topic "Handel - History, Myth, Enlightenment" - and won the second place.